Halloween (2018) is the 11th film in the forty year-old horror franchise but for all intents and purposes, it now becomes the second. If you don’t know this already then skip down to the next paragraph but the new film retcons the entire continuity, dispensing with every previous film in the series except for the 1978 original to which it is now the direct sequel. It also means that Michael Myers and Laurie Strode are no longer brother and sister. But hey…no big loss, right? I mean who’s sorry we can now forget about The Curse of Michael Myers, Haloween: Resurrection, and of course the God awful rob Zombie misfires. So it’s officially forty years later as the two hosts of a podcast travel to Smith’s Grove Sanitarium to visit Michael Myers just prior to his transfer to a new facility. His new psychiatrist Dr. Ranbir Sartain, a former student of Dr. Samuel Loomis, takes the pair out to a yard to find Michael and several other patients chained the concrete. They attempt to get a reaction from Myers by brandishing his old mask to no avail. And let me just say…this was stupid. I mean why is a mental health facility and the doctor going to let two podcasters waltz in just to mess with a psycho who killed a half dozen people? Sorry but that is one bad and pointless plot hole. The only thing you need to know is that Myers is being transferred which obviously creates an opening for him to escape…and he does…and so far writers Jeff Fradley, Danny McBride, and David Gordon Green don’t exactly impress us so far. Things get a turn for the better when we meet the near 60 year-old Strode, a twice divorced alcoholic living in isolation in a heavily fortified house, where she has prepared for Michael’s potential return through extensive combat training. She is regarded as the crazy family member by her daughter, Karen (Greer) and son-in-law Ray (Huss) and they try to keep her away from their teenaged daughter, Allyson (Matichak). The film is a slow burn as director David Gordon Green goes for the same sort of methodical pace that John Carpenter did in the original. Michael returns to Haddonfield on Halloween night (and like the only city that seems to trick-or-treat in broad daylight, setting up a final fight to the death with Laurie, whose paranoia is proven to be correct. By eliminating all of the previous sequels, Green cuts out all of the fluff involving the brother/sister relationship as well as the supernatural hoodoo. Laurie Strode did not go on to live under an assumed named as the headmistress of a private school. Instead she retreated into a life of loneliness, alcohol, and paranoia, making her every bit of the victim of those who were killed by Myers. For Jamie Lee Curtis, it is the kind of meaty, dramatic role that she has lacked in a career of mainly horror and light comedy roles. One could see her hesitancy in returning to the part of Laurie Strode but she certainly had to see that this was much more than another role of the victim. The final showdown between Myers and Strode is worth the wait although it falls short of being the epic showdown fans wanted…and in terms of this film delivering any finality to the franchise, well, let’s just say a sequel is already in the works. Making $237 million on a $15 million dollar budget will do that. Halloween (2018) is enjoyable, no doubt about it. There are some plot holes and totally useless muck to setup the final confrontation but it still succeeds in reigniting the franchise, something that Rob Zombie, as well as the producers of the recent Nightmare on Elm Street and Friday the 13th films, failed to do. Lots of good in the extras. I especially liked “The Legacy of Halloween” easily the best bonus extra. 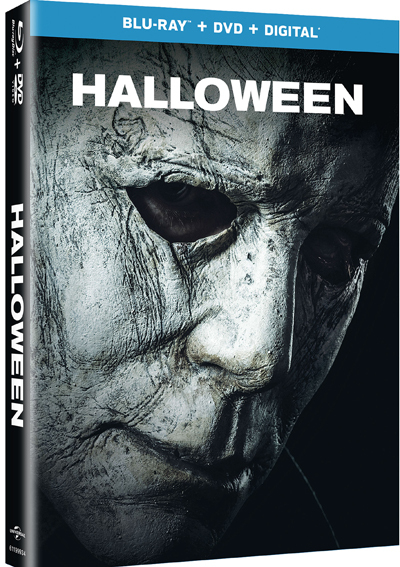 It features a roundtable discussion between Jamie Lee Curtis, John Carpenter, David Gordon Green, and Jason Blum and some interesting stories.